This episode is part of the English Legal System (Module 5): An Introduction to Criminal Procedure. See a Crown Court trial in reality, visit the ‘Old Bailey’ Central Criminal Court. Learn more on Defence barrister Christopher Kessling’s website. 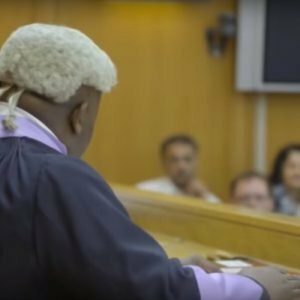 Watch a mock Crown Court trial with BBC ‘Young Legal Eagles’. Episode image: Still taken from Ministry of Justice UK YouTube video about jury members subject to Crown copyright. The Ministry of Justice UK website has lots of free resources here including an excellent and fun resource ‘You be the Judge’. Leave your comments below or via email. Podcast Pro Members get access to the transcription for this episode, which is automatically synchronised with the audio! Sign in or become a member to unlock. Unless otherwise specified the photos used in this episode are provided without the necessity to credit from websites such as www.unsplash.com. Some other photos used in the Podcast Pro material are stills taken from Ministry of Justice UK YouTube videos subject to Crown copyright: https://www.youtube.com/channel/UC0811l9hXnCu2GL5oZJn-GQ. The Ministry of Justice UK website has lots of free resources here: https://www.justice.gov.uk including an excellent and fun resource ‘You be the Judge’: http://ybtj.justice.gov.uk. What is Podcast Pro Classroom? I am a native British-English speaker, I’m a legal English teacher and the Founder & Producer of Study Legal English.